The JesterZ are a remarkably talented improvisational ensemble founded on the premise that you don’t need to be vulgar to be funny. 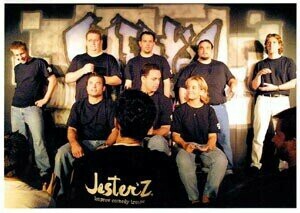 Reminiscent of the TV show “Whose Line Is It, Anyway?”, the audience makes up the scenarios the JesterZ perform to with hilarious and often outrageous results. Audience participation is encouraged, and is a vital part of the show.